Getting married is traditionally the best day of your life. Consumed with happiness, you both are riding high on the wings of love and nothing can touch you… or can it? Numerous wedding venues across the country have built up a reputation as being haunted. Sightings of ghostly goings-on have been reported by the bride and groom themselves, and by unsuspecting guests. Whether or not you believe in the spirit world, the following list of spook-clad buildings may have you delving into the venues’ haunted history before you check in for your romantic wedding stay. Number five on the list of spooky UK wedding venues is the historic, majestic, and (self-proclaimed) haunted Muncaster Castle. 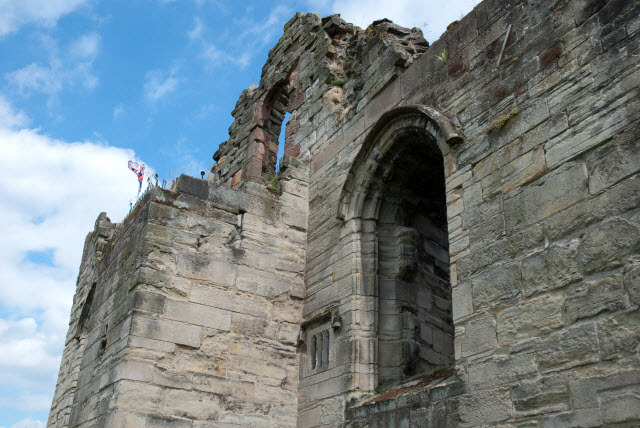 The castle is reportedly home to several ghosts, the most famous of which is Henry VI. The King took refuge here after his defeat at the Battle of Hexham, and is said to roam the corridors wailing in self-pity. Other ghosts that reportedly reside here include; a young girl who was hanged in the castle; a head-carrying apprentice carpenter; and, possibly the most feared of them all, Thomas Skelton (aka Tom the Fool.) Tom the fool was a 16th Century jester, and was one who took great pleasure in leading castle guests to their quick-sand induced deaths. His portrait reportedly hangs within the castle but is believed to be hidden somewhere in the private quarters. Yes, that’s right: the castle is still a lived-in family home and has been since 1208… It can’t be that scary then, can it? 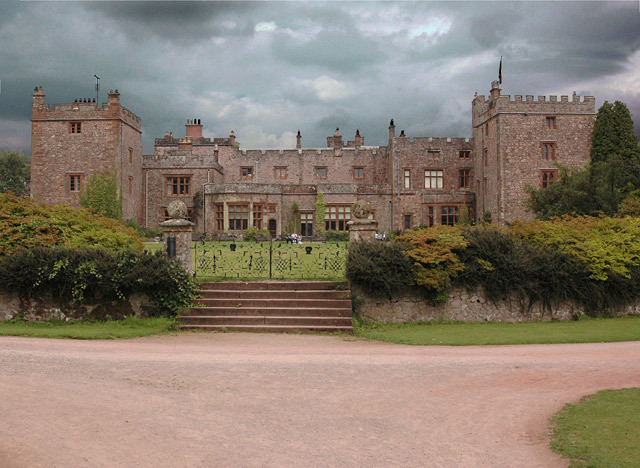 … it states Muncaster is haunted by Henry VI but while he did take refuge here as said, there are no reports of him haunting the place. We don’t claim a royal ghost! Re other ghosts mentioned – Mary Bragg was murdered on the road nearby, not hanged, and the head-carrying apprentice carpenter was a new one on us. However a crying child is often heard, people staying overnight often hear footsteps when there’s no-one there, door handles turn by themselves and room temperatures plummet for no apparent reason. The info about Thomas Skelton is ok except that his portrait hangs on public display. The second castle that features on the haunted list, and fourth in terms of frightfulness, is Staffordshire’s Tutbury Castle. Mary Queen of Scots is said to roam Tutbury’s corridors’: Mary was held captive here by Elizabeth I on four separate occasions. This spooky venue actively encourages the bride and groom to have a second torch-lit wedding ceremony at midnight. Furthermore, they are asked if they wish to participate in one of the venue’s infamous ghost hunts that take place within the spooky castle grounds as an enhanced ‘celebration’ of their nuptials. Over 40 male guests saw Marry Queen of Scots back in 2004 standing at the top of the south tower: thinking it was just the female curator donning a white gown, they all stood and laughed. The men later discovered that the curator was not on duty that night. In June this year, it was reported by archaeologists working in the grounds that a very active (and helpful) Mary was seen taking part in one of their seasonal digs. Potentially built on a Roman villa site, this Neo-Gothic mansion is number three on the list of haunting hollows. 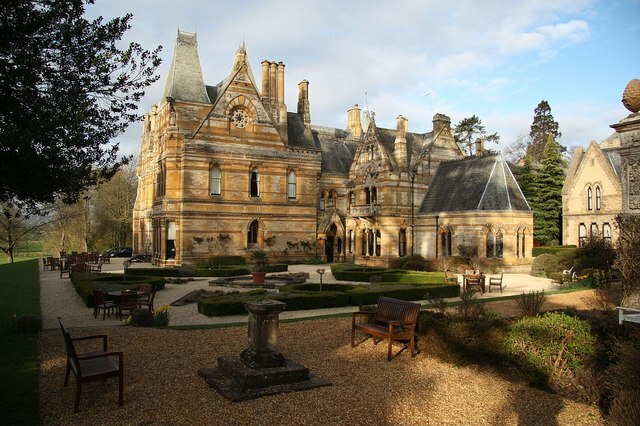 Ettington Park Hotel has a rich and varied history: The building was used as a Prisoner of War camp following World War II and, prior to that, a nursing home. A luxury hotel since the 1980s, Ettington was the spooky setting for the movie, ‘The Haunting’, filmed in 1963. It has also encountered raging fire forcing it to close for many years prior to it’s re-opening as a licensed establishment. BBC Coventry and Warwickshire spent an evening ‘ghost-busting’ at the hotel in 2006. Although they experienced no major goings-on, they did encounter a sudden and dramatic drop in temperature in certain rooms, and spent the evening on tenterhooks after hearing the staff’s ghostly tales. There have been countless ghostly reports at the hotel over the years; namely, moving books in the library; apparitions of a grey haired lady, a groundsman, and a servant; singing voices heard in the drawing room; and a candle hovering over a mantelpiece in the reception area. Two of the notable spirits taking residence at the Ettington are thought to be the ghosts of John Pritchard and Edward Shirley. 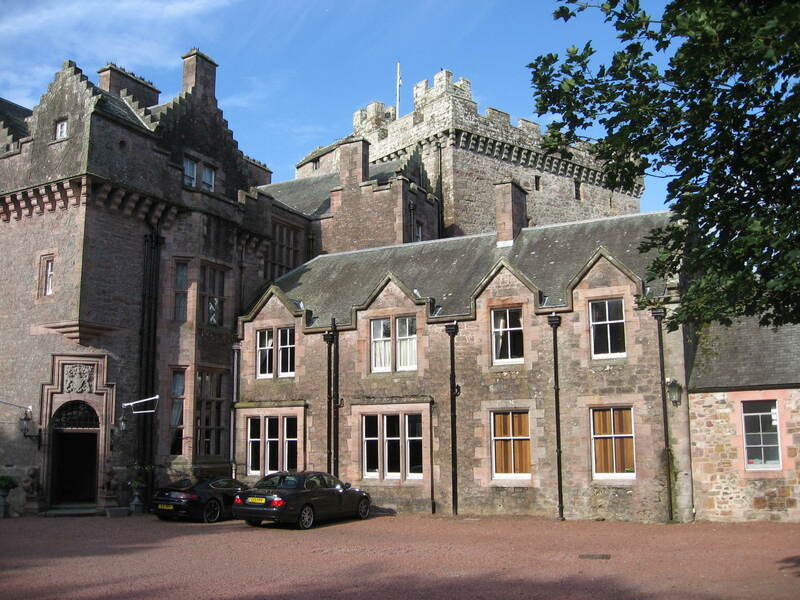 The runner-up in our most haunted wedding venue list is the 15th Century, Scottish border stronghold – Comlongon Castle. This magnificent building has a very conspicuous, and very permanent, resident in the form of Lady Marion Carruthers. Lady Marion was said to have been ‘driven to madness’ back in the 16th century after being held captive in the building for many years. 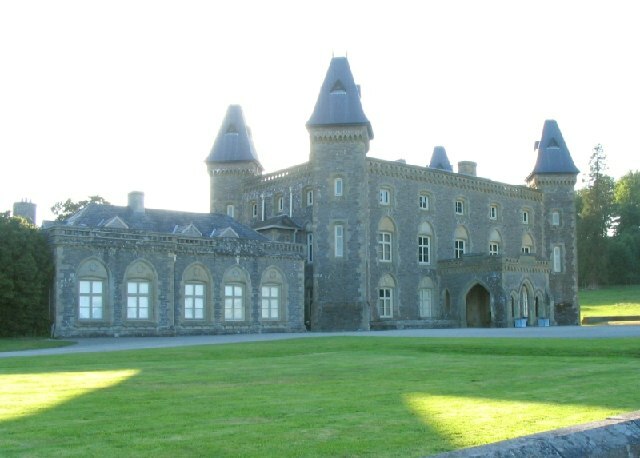 After being granted permission to marry her, Sir James Douglas – of the powerful Douglas family – would become joint owner of the family estate – Mouswald Castle. Marion tried to get out of the imminent marriage, but all attempts failed so she fled to her uncle’s castle and sought sanctuary at Comlongon. Marion was eventually court-ordered to surrender herself to James, and he did in fact inherit her estate. After many torturous years, it is believed that, the now insane, Marion committed suicide by leaping from the castle’s lookout tower. Some, however, believe that Marion was actually pushed to her death by James’ men after being ordered to do so. So, we have reached number 1 in our list of UK’s most haunted wedding venues. 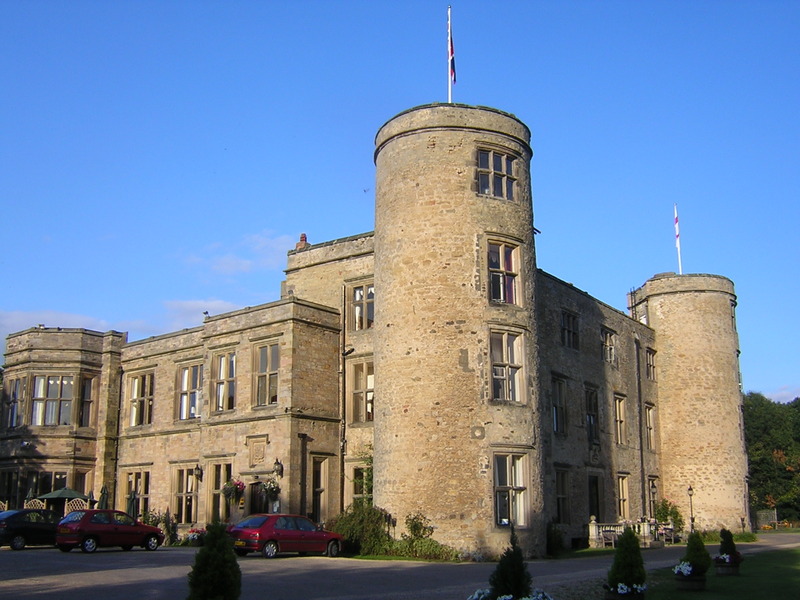 It may be surprising that the top spot goes to a hotel from the Best Western dynasty, but this no ordinary modern day chain: the building is a Grade 1 listed, Medieval-styled castle that was commissioned and built prior to 1600. Walworth was home to over 200 German and Italian captives in the World War, and has also been a council-run girl’s school in the 50s. A private hotel since 1981, and gaining a wedding license shortly after, the building is said to be haunted by a former pregnant maid who had an affair with the Lord of the house. Fearing others would find about his illegitimate child, the Lord is said to have had the maid bricked up into the wall of the castle’s spiral staircase that conveniently, was having work done to it. The spirit of the ill-fated maid is said to now roam the hotel and countless paranormal activities has been cited: Guests have been woken up by rattling tea cups; a female ghost has been seen roaming what was once the corridor to the honeymoon suite; ascending footsteps have been heard coming from the staircase at the rear of the library; and chambermaids have even reported having their hair pulled. Reports most closely linked to the tale of the maid include that of a ghostly woman emerging from one of the walls in the staircase, and guests hearing a woman desperately crying from behind the stairs in question. Would you get married in a haunted venue? Ask your wedding guests to dress up as ghosts, have a themed wedding and appear in the papers? Are you planning a wedding for 2014? 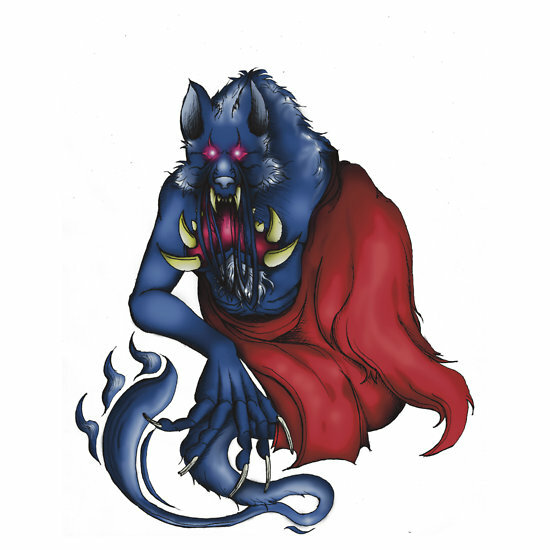 What tips, sites and deals would you recommend to fellow In Pure Spirit readers? Image credit: Walworth Castle picture by Ulleskelf released under Creative Commons. Penkaet Castle is situated just outside of Pencaitland and is one of those centuries old mansions that are a delicious blend of history and hauntings. As with any such combination, it elicits admiration, curiosity and a nervous tingle down the spine. Built over 400 years ago, this cream sandstone has seen several phases of additions being made to the original building and a few name changes as well. In 1971 it was listed as a category A building. Originally known as Woodhead, the property was home to the family of Sir George Cockburn of Ormiston. Legend has it that a relative of Sir George, John Cockburn, killed another relative, John Seton. In 1635 Sir George took the decision to sell the mansion. It was later granted to Lord Fountainhall and took on the family name. 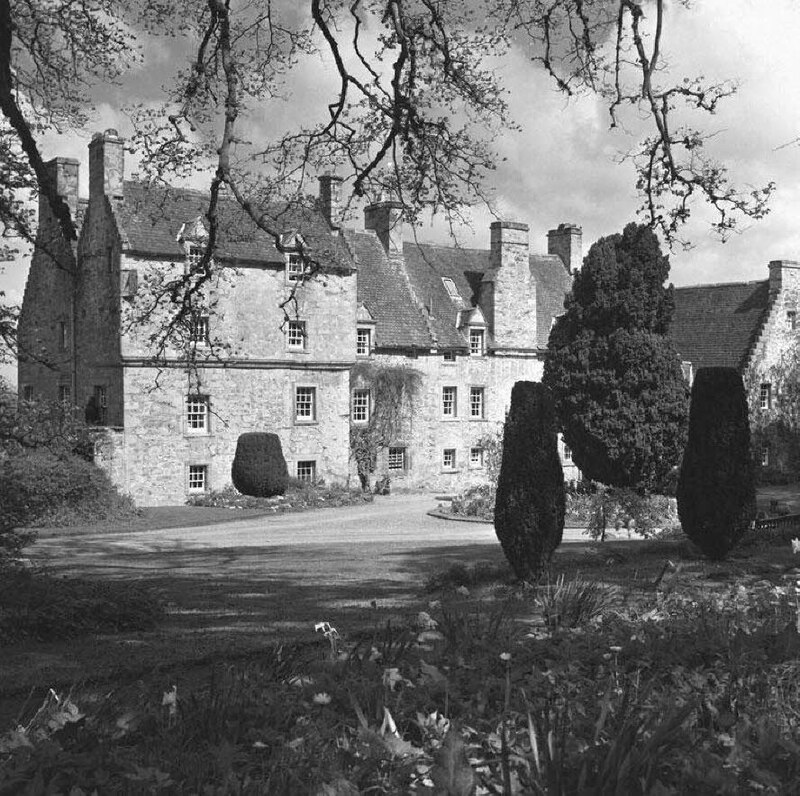 A direct descendent, Sir Andrew Lauder, became the new owner in 1695 and the property was retained by the family until 1922. When Professor Ian Holbourn, an author, acquired the home he promptly renamed it Penkaet Castle, although later owners decided it should revert back to Fountainhall House. Like any self-respecting centuries-old home, Penkaet Castle seems to have trapped the tortured spirits of a few of its past residents or callers. Probably the most talked about ghost is that of Alexander Hamilton, who begged for food and shelter from the Ormiston family. 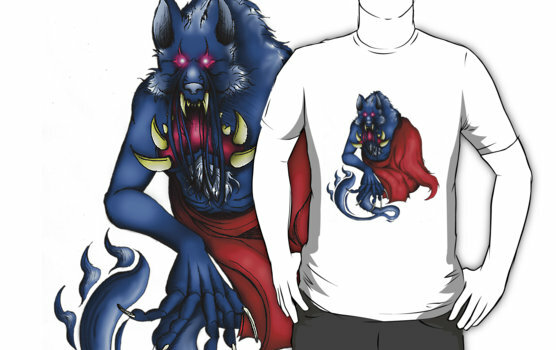 On being denied and roughly removed from the property, he screamed out a curse upon them all. Only a few days later, Lady Ormiston and her daughter suddenly and mysteriously died. Hamilton was arrested and after admitting to tying some blue thread to the doors of the castle, he was put on trial for witchcraft and subsequently hanged at Edinburgh Castle. His ghost has reportedly been seen hovering at the main doors on many occasions. John Cockburn’s murderous spirit is also said to frequent a cupboard in the mansion from which it sometimes emerges to walk the length of the room and exit through a wall. The most illustrious ghost is apparently that of Charles I whose bed, complete with death mask, was a gift to the mansion’s most recent owner, Prof. Holbourn. The former sovereign still appears to have the occasional nap here, as the bed is often found in unexplained disarray. Tales such as these will ensure that Penkaet Castle remains of great interest to many future generations. It’s not unusual for buildings to change their names but have you ever known a home to have had three different names that are still vying for influence? Have you any more stories of hauntings or notes of history for Penkaet Castle? Image credit: Clan Pringle, Pringle’s of Woodhead. Ebay may be getting fussy about people selling charms and spells but that does not stop people describing items as they see fit. 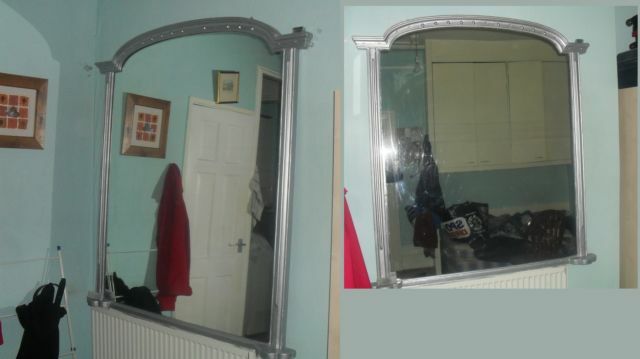 In this case MrJoiee clearly states that this large Victorian style mirror is haunted. The mirror was originally up in the hallway of the building we live in (a house, converted into 10 different apartments of varying sizes, ours being Flat 1). One afternoon, after the maintenance people had been carrying out work on the inside of the building, we returned from shopping to find it on the front lawn among other rubbish. My flatmate asked the landlord if we could take it to put up inside our own flat, as he had planned to throw it out entirely. We rested it on the wall above the radiator, where it has been ever since. 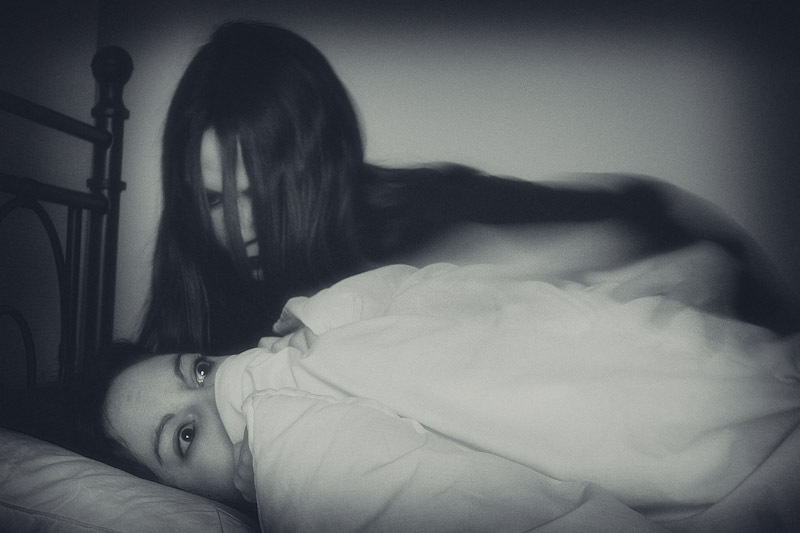 Many times since putting up the mirror, both myself and my flat mate have woken in the early morning hours screaming in pain. We both experienced what I can only describe as intense sharp stabbing pains throughout out bodies. They would strike us both at the same time, then dissapear as fast as they came. Our original suspicions were that somebody was performing some kind of voodoo or Black magic on us. The mood in the flat turned sour. I felt constantly as if there was a sense of impending doom upon us. As if something awful was about to happen. Both of us began to feel zombie like, as if drained of all our energy. Many times over the course of the next few months we were unable to move out of bed, our bodies weak and tired for no apparent reason. However, leaving the flat for any short amount of time would make us both feel instantly better. Upon returning to the flat, the zapping of energy feeling would strike again. One night, my flatmate became terribly ill. He could not stop shaking and complaining of feeling cold, despite the fact his temperature was extremely high. Worried, I called an ambulance and we rushed him to hospital. He was experiencing a tight cramping feeling in his leg that would leave him crippled, keeled over on the floor screaming in pain. Despite tests, the doctors found nothing wrong to warrant such pain. With my flatmate working most days, I spent a lot of time here alone in the flat. I became paranoid and had the uneasy feeling that I was constantly being watched. My anxiety levels reached an all time high, which led to me being prescribed antidepressants by my doctor for the first time in my life. While I had calmed down enough to be able to tolerate being alone in the flat, I couldn’t help but notice strange things happening around me. I would put things down and they would dissapear. Things were constantly going missing, keys, phones. Entering the bathroom one morning after hearing a loud bang, I found objects strewn out across the floor, and a tub of shaving foam, which had been on the other side of the room, headfirst down the toilet. Pictures have fallen from the walls. Many times while passing the mirror, I would see flickering shadows reflected in it. I would stand completely still and yet would continue to see them, quick glimpses of black darkness, darting around in the space behind me. Last week I woke up startled at 3.30am with a pain in my lower back and bottom that felt like I’d been burned. I got up and looked in the bathroom mirror to find myself covered in deep red scratches going in all directions. I have short fingernails, and after checking the bed found nothing sharp or no loose springs that would explain such a thing. 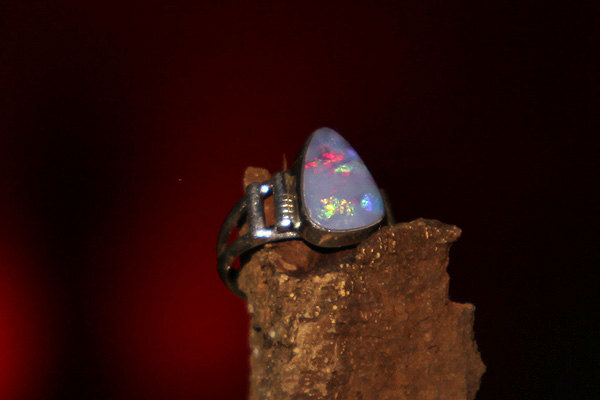 A photograph of the scratches is included in the eBay description. 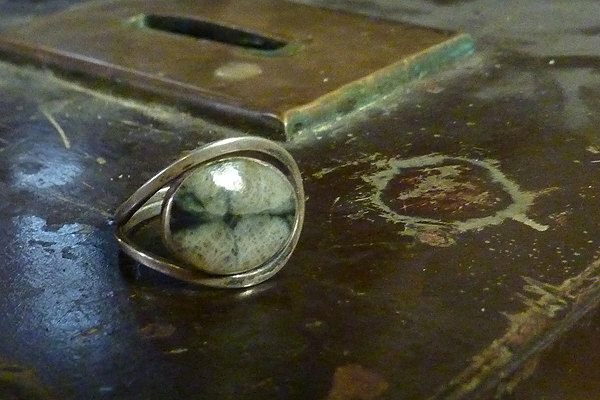 At the time of posting the auction was still open. You could bid or just check to see what the result was. This is a clever sales ploy to drive up the price of a dodgy looking mirror. Don’t you agree? Ghost on video: A haunting in Ashford? 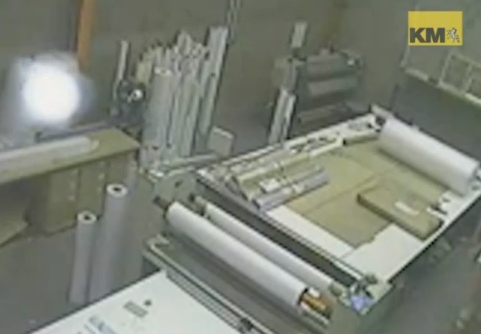 At the Montpelier Business Park in Ashford, Kent, the printing firm SMP Large Format, recorded something strange on their CCTV. 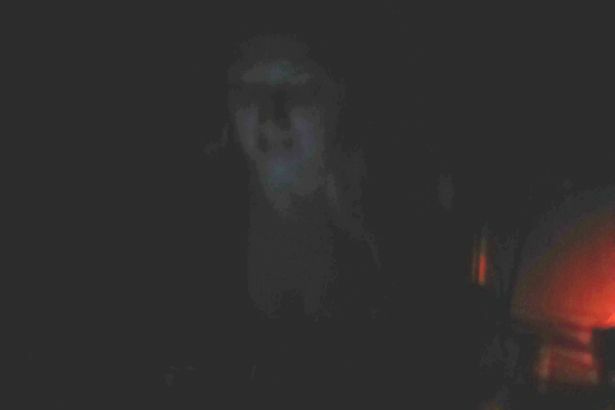 A mysterious “ghost” – certainly a white shape – can be seen entering the video from the right and floating over to the left. 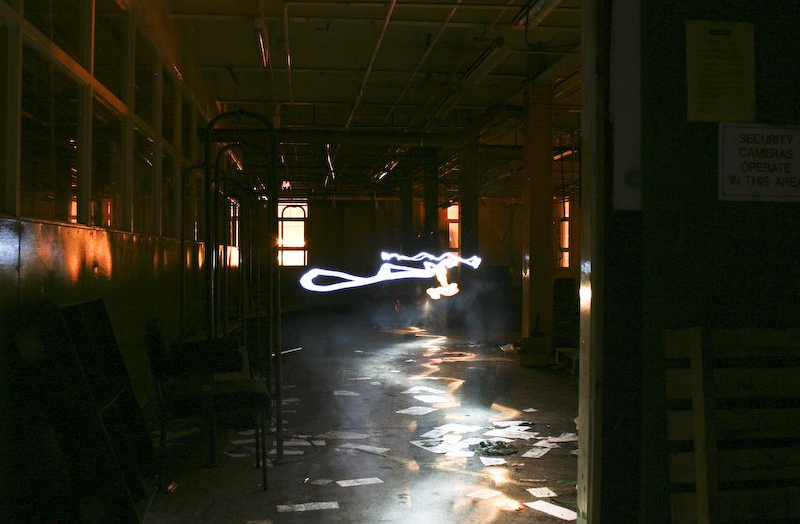 Paranormal investigators talk a lot about orbs. Some cite them as valid supernatural activity but others, and sceptics, dismiss them as dust or camera flare. “I am not a sensationalist, but the boys who work in the factory feel there is something there or watching them. 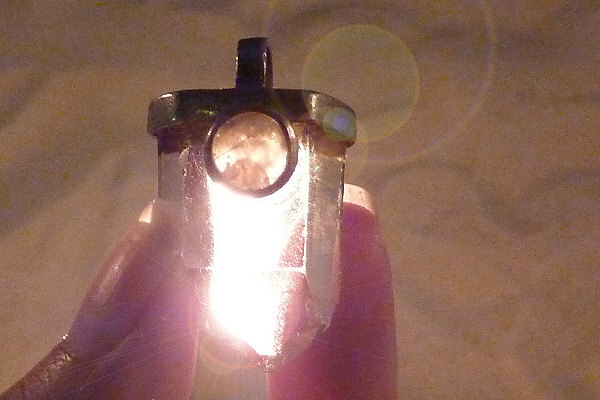 “We have not seen this orb or glow again since, but a couple of them have said they’ve noticed their tools being moved. Montpelier Business Park is near Victoria Park and about 20 minutes drive from the village of Pluckley. Some consider Pluckley to be the most haunted village in England. What’s your opinion of the video? Is this paranormal activity caught on tape? Or is this something else?